The Ford Bronco II is a compact Bronco that was based upon the Ford Ranger base. FordPartsOnSale.com is the best place to find OEM Ford Bronco II parts. All of our parts are genuine Ford parts, and we never sell cheap aftermarket parts that may not fit your Bronco II. 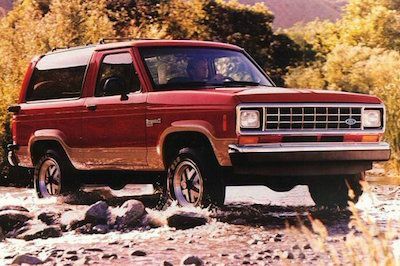 We offer a large selection of parts for your Ford Bronco II with parts dating back to the 1980s. Shocks and Struts – Your Bronco rides smooth due to the shocks and struts that are under the body. Since you off-road with it, you might wear these parts out at some point. We carry shocks and struts, as well as other suspension parts. Alternators – The alternator keeps your battery charged up, and should the alternator fail, your battery will not be able to keep a charge. We have replacement alternators, starters and batteries. Belts and Hoses – The belts and hoses are regular maintenance parts that need to be replaced at some point. Check them often. We have these parts and others like filters. Call us today at 585-475-1064 or visit FordPartsOnSale.com to place an order. We have everything you need for your Bronco II at the best prices you will find around.